In some public aquariums, fish farms, and aquaculture facilities, a sampling of fish are actually weighed before they are introduced to a system to prevent over-crowded conditions. It is impossible to do this for the average home aquarium. A great deal of experimentation over many years has allowed professional aquarists to come up with general guidelines, based on the total number of inches of fish kept in an aquarium. Although these suggested limits are based largely on educated guesswork, aquarium owners who follow these guidelines are usually successful. The guideline of an inch of fish per gallon of water is based on a standard rectangular aquarium of normal height. If you have an unusually-shaped fish tank, such as a hexagonal, or extra high aquarium, try keeping one inch of fish for every 12 square inches (length times width) of aquarium surface area. Remember to allow for growth. every fish species have a different body mass and produce a different amount of waste. According to this rule, my 25 gallon aquarium could hold a maximum of 25 neon tetras (one inch each) or 12 goldfish (two inches each). Unfortunately, a single 2 inches goldfish will probably produces as much waste as the 25 neon tetras all together. I use to keep 40 neon tetras in a heavy planted 25 gallon tank without problems. Things could have been different with another fish species. Start with 25% of the total capacity of the aquarium in inches. Wait at least two weeks before adding more fish. Waiting three weeks is better. Do a 25% water change before you add new fish, not immediately after. 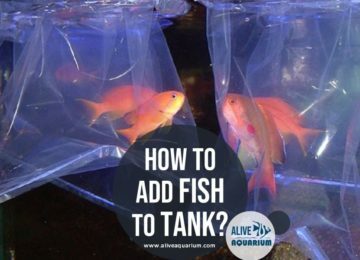 Add in increments of 100% of the number of inches of fish the aquarium already contains (if you already have two inches of fish, only buy two inches more), until the tank is stocked to 90% of the total capacity. Then allow the growth of the fish you have to fill the aquarium to capacity. Saltwater has far less dissolved oxygen than freshwater. The rule we use for saltwater is three inches of fish for every square foot of surface area. For example, a 55-Gallon aquarium (48″ Long by 13″ Wide) has approximately four square feet of surface area, so approximately twelve inches of fish can be kept in a 55-gallon aquarium. In saltwater, look for quality, not quantity! If you have a wet-dry filter or Berlin reservoir, you can technically count the square footage of the filter in your calculation of how many fish may be kept, but there is one drawback to doing so. If you have a long electrical power failure, your tank will be over-stocked, and the fish will run out of oxygen much sooner. Start with 25% of the total capacity of the aquarium in inches. Wait at least five weeks (six is better), and then test the water for ammonia and nitrite. If you do not get a zero reading for BOTH tests, do a 25% water change and wait another week. Continue this process until BOTH tests read zero. Then add no more than 50% of the inches of fish you already have in the tank (if you already have four inches of fish, only buy two inches more). Do a 25% water change before you add new fish, not immediately after. Do not add fish to the tank more frequently than every two to three weeks. Stock the tank to 90% of the total capacity. Then allow the growth of the fish you have to fill the aquarium to capacity. There are exceptions to the three inches/square foot of surface area rule for saltwater. An eel is long, but is also skinny, so using ¼ of it’s body length as a measure is safe. A large angelfish is almost as tall as it is long, and puffers are wide in girth, so using 1-1/4 of these fish’s body lengths as a measure is probably more accurate. Stock your marine aquarium at 75% of it’s total capacity to allow for growth. Increasing or improving the aquarium filtration used can also increase the number of fish that can be kept. A wet/dry filter may actually double the capacity of an aquarium, depending on what types of fish are kept, but remember that filters don’t operate during a long power failure. The dissolved oxygen level in the water of the aquarium is the biggest limiting factor. This is more important in saltwater tanks, where the high density of the water greatly reduces the amount of available oxygen. The size of the nitrifying bacteria population in the biological filter determines how much toxic ammonia (fish waste) can be processed. If there are too many fish in an established aquarium, tests for ammonia or nitrite will be positive. The beneficial bacteria population for an established aquarium is adequate if there is no ammonia or nitrite present. The types and sizes of filtration the aquarium is equipped with greatly influences the number of fish that can be kept. Using several filtration methods on the same aquarium that remove different forms of waste can increase the capacity of a fish tank, but one needs to remember that during long power outages, too many fish can be disastrous. The number of territories (hiding places) that exist in an aquarium can limit the number of fish that can be kept. This is a factor that is usually ignored by uninformed aquarium owners. A clean tank with the best filtration available may only support a few fish, if they don’t have adequate cover. A properly decorated tank with plenty of hiding places and caves allows the fish to “feel at home,” so they don’t fight and stress each other to the point of killing one another. The behavior patterns and aggressiveness of various fish is also a factor that can limit how many fish can be kept together. Keeping fish together that are unevenly matched in aggressive tendencies usually leads to a tank with one or two very happy fish in it. Fish do not grow to the size of their environment, and then stop growing. The growth rate of all of the fish in an aquarium slows as the population reaches the oxygen limits of the environment. Each fish also limits the growth of the other fish by secreting growth-limiting hormones (GLH) into the water, which explains why some fish grow more rapidly than others. Unfortunately, if a tank is overcrowded, fish that grow large in the wild will become deformed, as bone growth often exceeds muscle growth when oxygen levels aren’t high enough. Other fish are simply crowded out and die “mysteriously.” This happens frequently in saltwater aquariums that are overstocked. A fish dies for no apparent reason, and the aquarium owner runs out and buys a replacement. A week or two passes, and another fish dies, and another replacement is purchased. This process may continue indefinitely, or until the aquarist runs out of money. It is always a good idea to determine why a fish died before replacing it. Oxygen test kits are available to determine if an aquarium has an oxygen deficit. Adding air bubbles through an air pump to an aquarium does not add a lot of oxygen! The air bubbles do not dissolve in the tank, but rise to the surface, and break. This slightly increases the surface area of the aquarium, and aids in the exchange of gasses, but not enough to add a lot more fish! Air is mostly nitrogen, not oxygen, so unless pure oxygen is pumped into the tank, the main benefit of using an air pump is to increase surface area, and of course, because bubbles may look cool! If too many fish are kept in an aquarium due to the increased surface area an air pump provides, what happens when you have a power failure? Keeping many small fish is NOT equivalent to keeping a few large fish! This is a common mistake made by new saltwater (and occasionally freshwater) aquarium owners. Smaller fish are simply very young specimens that are going to grow. As they grow in the overstocked aquarium, one fish will die at a time, until the population balances out with the limits of the environment. Keeping more specimens together that STAY SMALL as adults may work, but it is important to remember that territorial and behavioral limitations may still affect the number of these smaller types of fish that can be kept together. Two of the same species of fish ARE NOT THE SAME FISH. Just as different people have different metabolisms and behavior patterns, so do all other species of vertebrates. A particular species of fish that worked fine before, may not work the second time around. Bleaching coral and over-cleaning reduces the number of fish that can be kept in an aquarium. 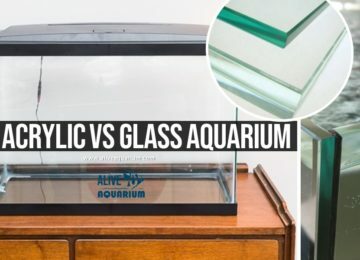 An aquarium that is kept ultra clean and immaculate is a less stable environment. The algae and bacteria that grow on the decorations are beneficial. 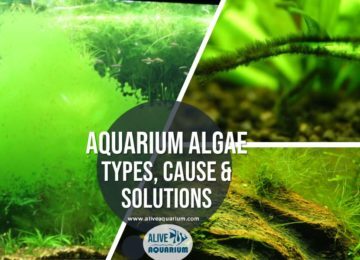 The algae in Aquarium provide oxygen for the fish. Cleaning the coral on a regular basis will only work well if fewer specimens are kept in the tank. Be kind to your fish . . . don’t overcrowd your tank! Fish get their oxygen from the water they live in. There is only so much oxygen dissolved in water, and oxygen can only enter the aquarium at the water’s surface. It is better to be conservative when stocking your aquarium. Your fish will live longer, healthier lives, and you will save money.